Many drugs exert their therapeutic effects by binding in cavities or pockets on specific target protein macromolecules. The binding pockets on proteins are mobile and dynamic and constantly changing shape. Some pockets or subpockets can be described as transient because they are not always present in the given protein. In structure-based drug design procedures, the dynamic nature of the target protein is usually neglected. A crystal structure of the protein may not reveal transient pockets as it provides a picture of a fixed state of the protein. The analysis of molecular dynamics simulations of a protein can however reveal them. 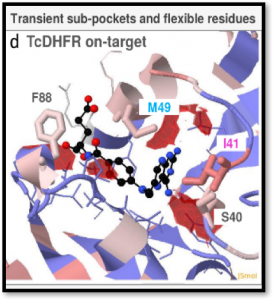 Transient pockets are particularly interesting because they can open and close, allowing ligands to bind. Transient pockets can therefore be exploited to design compounds with greater target specificity or better kinetic binding properties than would be achieved by considering the target as a static structure. An example of the application of TRAPP to aid drug discovery for neglected tropical diseases caused by trypanosomatid parasites. By comparing sequence conservation in the binding pockets of a set of parasite and human proteins, 3 residues in the enzyme dihydrofolate reductase with selective binding and dynamic properties could be identified for targeting in the design of anti-parasitic agents (see picture, red contours show appearing subpockets). 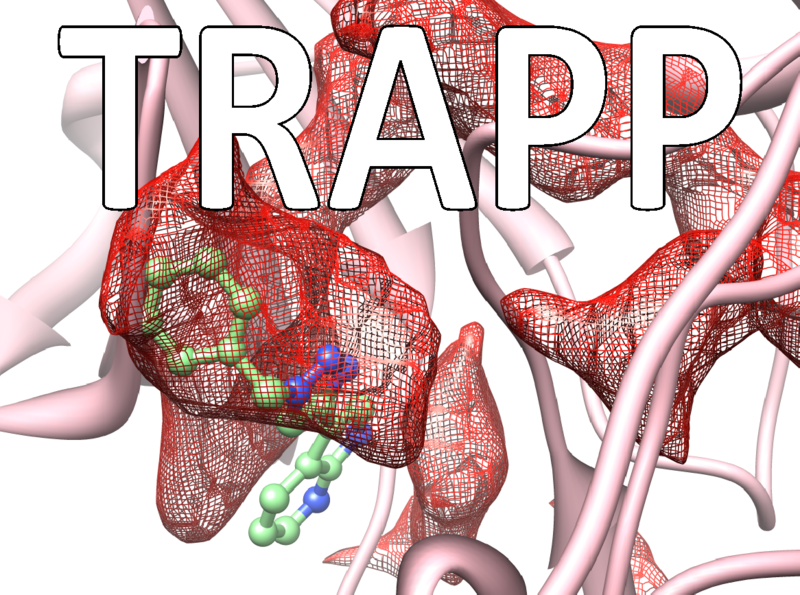 The TRAnsient Pockets in Proteins (TRAPP) webserver, developed in the Molecular and Cellular Modeling (MCM) group at HITS and recently published in the journal Nucleic Acids Research, allows users to employ a range of computational methods to generate snapshots of protein structures, to evaluate them for flexibility, and to detect and characterize transient pockets. 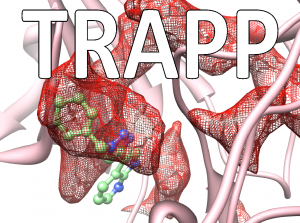 The information TRAPP provides can be used to explore protein motion and flexibility, the appearance of transient pockets and the physiochemical, sequence and functional characteristics of binding pockets. The TRAPP webserver provides a user-friendly environment for a dynamic-structure-based approach to drug discovery.